This year’s Internet of Things (IoT) conference produced by IoT613 has again exposed the diversity of technologies and applications in the IoT space and showcased a flourishing IoT ecosystem in the National Capital Region. Held at the iconic Canadian Museum of History, this three-day event delivered a great platform to learn from expert speakers and workshop leaders from the region, Canada, and abroad. The immersive workshops and networking sessions provided conference goers unfettered opportunity to interact and connect with each other, forming and strengthening linkages among IoT actors within and outside of the National Capital Region. The conference kicked off with a day of interactive technical and business workshops. The business workshops, led by Megan Cornell, Nilufer Erdebil, Frank Rayal and Kevin Fernandes provided students key business skills and knowledge they could immediately apply – including privacy law, innovation and design thinking, business development, and project funding. The interactive and lively group work not only engrained the knowledge transferred from the experts, but also enabled participants to learn from each other’s business experience and to form business connections. Brian Innes and John Walicki, Developer Advocates from IBM’s Worldwide Watson IoT team were flown in from the UK and NY area, respectively, to lead the technical workshop. 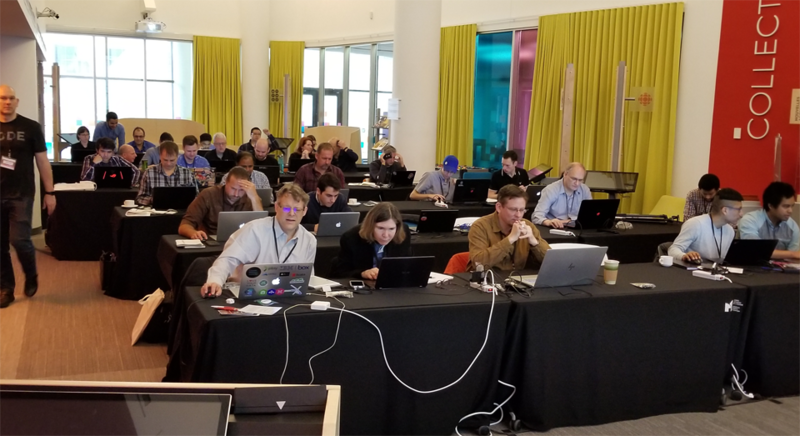 John and Brian spent a full day guiding intermediate to advanced developers through the rigors of capturing environmental sensor data, Watson analytics, integrating APIs, implementing IoT security protocols, and more. Participants were so engaged in their work that you could barely hear a peep from the room the whole day! 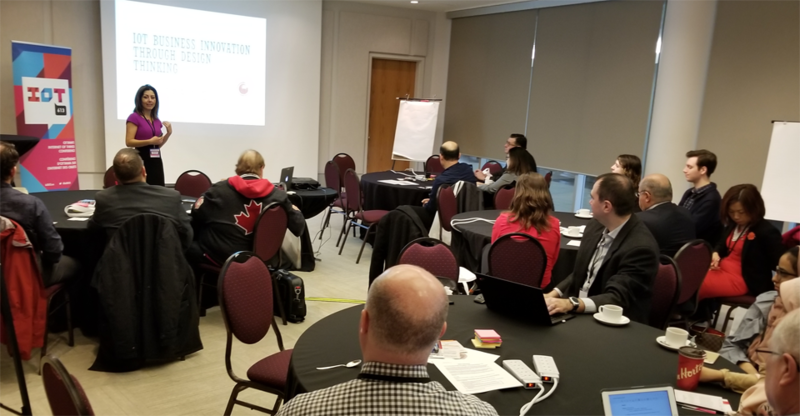 Even Dennis Buttera, Education Lead of the Centre for Advanced Studies at IBM Canada felt this was the best IoT workshop he had ever attended. 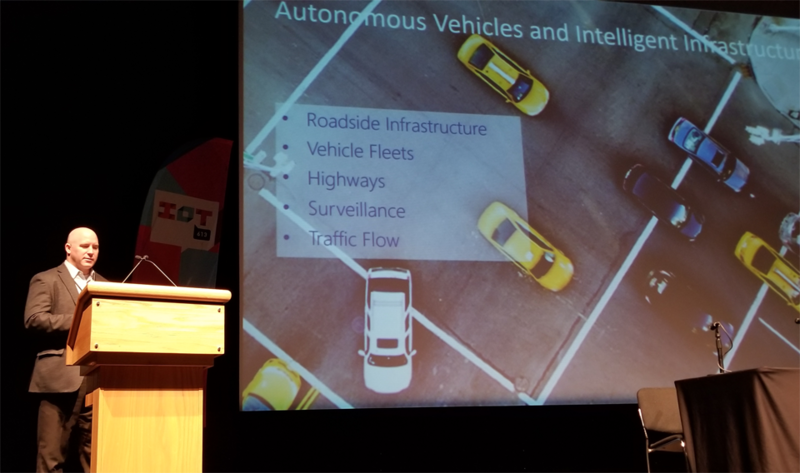 The conference goers were treated to a full day of insightful talks on IoT based connected transportation covering rail, road and air transport modes, and critical topics such as safety and human-machine interfaces and leveraging vehicle and infrastructure data for a smarter and more efficient transportation system. The opening keynote by Ellis Lindsay from Nokia emphasized the importance of network services for IoT in transportation. In his closing keynote, Craig Hutton of Transport Canada, the conference platinum sponsor, addressed the disruptive impact of technologies such as IoT, the need for innovation in corresponding public policy response, and provided an update on federal government efforts on the front. The day also featured an hour-long Social Impact of IoT panel discussion, moderated by Jenna Sudds, featuring four researchers and policymakers. The panel provided us with some thoughts on positive aspects of the implementation of IoT and artificial intelligence, but there definitely some more serious considerations on security brought up. Lineups at the audience microphones were long, but in the final question of the day, “name one thing you would not want see connected to the internet,” Paul Harding, President of InnoGov Canada, provided us with perhaps the best answer to a question of the day, when he specified that he would not want to see his toilet connected to the internet! Despite some potential interesting benefits in terms of predicting or diagnosing health risks, Paul just does not want to receive any sort of medical news from his toilet. Shifting gears for the final day, attendees were provided a thorough review of different wearable technologies, with topics covering design best practices, device security, and challenges in verticals such as healthcare, fitness, and defense, plus were treated to an immersive session on augmented reality and smart eyewear. In a featured presentation, Dylan Horvath of Cortex Design described the process that went into becoming the first ever Canadian XPRIZE winning team for their VITALITI medical tricorder. Opening keynote, Leo Valiquette of intelliFLEX Innovation Alliance provided an extensive review of Canada’s wearable technology industry, highlighting our key strengths. Wrapping up the day and the conference, was Sheila Narasimhan of Wear OS by Google’s user experience (UX) research team. Sheila described Google’s worldwide research trips, called UXpeditions, on which they learn how wearable IoT devices are being designed and used around the world. A common theme throughout the day was the technologies themselves, while the needs they address changed based on the vertical in which they were implemented. It spoke to the robustness, flexibility, and quality of the hardware and that materials, sensors, and processors are providing us the opportunity to gather very important information from people and the places in which they work, live, and play. Human behavior and movement continue to prove very difficult to predict, model, and design for, but as we saw from Google’s UXpeditions, the future of wearable technology and “personal” IoT is not far off and is quite exciting. The Internet of Things is present and here to stay, with the National Capital Region sporting a thriving IoT ecosystem as demonstrated by the 613 Showcase featuring local IoT based start-ups – another highlight of the conference. By all accounts, attendees gave a big thumbs-up to the conference program, quality of speakers and panels, and the overall learning experience. 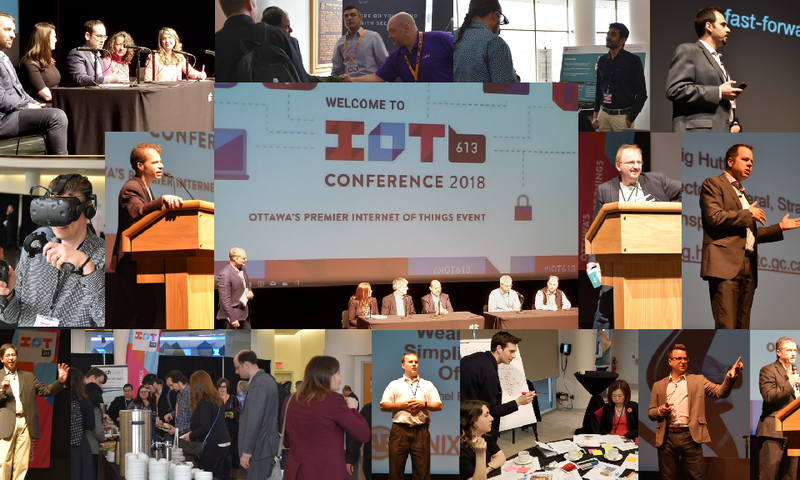 The IoT613 team will shortly start planning new IoT events, continuing the momentum to coalesce and strengthen the Internet of Things community. Stay tuned to our social media updates, newsletter, blog, and podcast for updates and to discover more about IoT!